Broiler production and weights were up again in January in line with expectations, while broiler prices were generally steady during February. Broiler meat production in January was 3.6 billion pounds, about 4 percent above a year earlier. 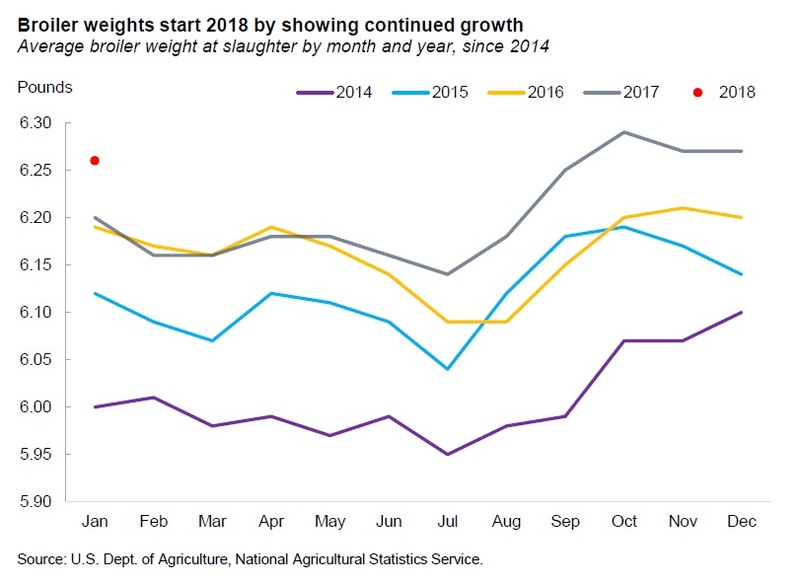 Much of the growth was due to an additional slaughter day this year, while the rate of production (per slaughter day) was a bit lower. Higher bird weights, nearly a percent higher than a year earlier (see the figure below), also contributed to production growth. Hatchery data has continued to indicate growth in bird availability through the end of the current quarter. The production forecast was not changed for the current or any later quarter in 2018, totaling 42.6 billion pounds for the year, according to USDA’s latest Livestock, Dairy, and Poultry Outlook. Broiler exports in January were 548 million pounds, about a percent lower than last year. Year-over-year declines were spread across a number of countries, including Democratic Republic of the Congo (DRC), Republic of the Congo (Brazzaville), and Canada. Export losses were partially offset by significantly higher shipments to Cuba, Taiwan, United Arab Emirates, and the Philippines. February weekly prices for whole broilers (national composite) were almost steady, and the price was slightly over 91 cents per pound for the week ending March 2. A lack of upward momentum over the past few weeks contributed to a slight reduction in the first-quarter forecast to $0.93-$0.94 per pound. Prices are still expected to average about 5 percent above 2017. Given current prices and expected seasonal gains in the first part of the second quarter, the price forecast for the second quarter was raised to $0.96-$1.00.